Click here for a closer look at the map. What time does the parade start? 1 p.m.
What time do the streets close? From roughly 12:30 to about 3 p.m., according to West St. Paul police. 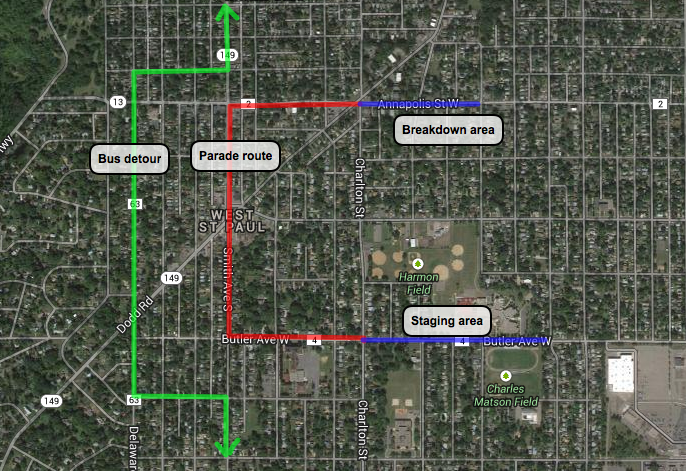 This includes the parade route, staging and breakdown areas, and side streets one block on either side. No parking will be allowed on the parade route starting Saturday morning. Signs will be posted as appropriate. OMG, I live on the parade route, and I need to get to work! What do I do? Police will be flexible and allow people in and out as needed (you won’t be able to drive on Smith during the parade, though). If you *absolutely* need to get to your car during the parade, the smart thing to do would be to move it to a side street ahead of time. I need to get to the store! What do I do? Police will be somewhat flexible allowing cars through on Dodd/Bernard to access the Doddway shopping center. But maybe get those errands done in the morning or save them for later. What about the bus? The Route 67 bus will detour to Delaware Avenue, as shown in green on the map. Rider alerts will be posted at affected stops. This will be a good detour if you’re driving, too. My family wants to ride our bikes to the parade, where can we park? There is only one bike rack in the area, on the south end of Doddway shopping center. Otherwise bring a cable lock and hope for an open signpost somewhere. Speaking of parking: Please don’t park in business lots unless you’re shopping there. There’s ample street parking in the neighborhood. Will there be food? Drinks? Yes! Stop by Amore Coffee, the Cherokee Tavern, Gallaghers or Los Arcos for sit-down dining/refreshments. Taste of Love will also have lots of treats, and Jim’s Market is also right on the parade route. What else is there to do? West St. Paul Antiques, Simply Vintage, Eclectic 887 and other shops are also located on the parade route near Smith and Annapolis. I heard the Cherokee is having a street dance on Friday. Will Smith Avenue be closed? No. There will be no street closures for the street dance, which will be held in the parking lot of Cherokee Dental on Annapolis. Smith Avenue should do this sort of thing more often! Well, we are planning to hold Art on the Avenue again this year, on August 9th. We need volunteers to distribute flyers, email stubbornlylocal [at] gmail [dot] com if you’re interested in helping out. Thanks! What about the other West St. Paul Days events? Full schedule can be found here.